If you have slides or negatives you would like to scan for archiving or for printing, you have two options for digitizing them yourself. You can either buy a flatbed slide scanner or you can buy what is called a slide converter. It is far more cost-effective to buy a digitization device for your old 126KPK, 135,110, and Super 8 negatives, than it is to go out and pay someone to do it for you. All the while, without losing any quality and needing any extra equipment. Scanning your slides and negatives with a higher-end flatbed photo or slide scanner is the preferred method for producing high-quality images. A slide scanner can scan at very high resolutions and usually comes with built-in functions that can enhance the images such as dust and scratch removal or color adjustments. But scanning slides with a slide scanner take a great deal of time. It is a slow process and choosing resolutions and adjustments can involve a bit of a learning curve. That’s probably why slide converters have become a more popular option over the last few years. Some people don’t have the time or don’t need super high quality scans but just want a quick and easy way to convert their slides to digital images for archiving. That is where a film and slide converter comes in. A digital slide converter doesn’t scan the slide or negative, it takes a digital photo to produce a simple JPG image file. This makes the process of digitizing much faster, but the quality of the outputted image will be much lower than you would get with a photo scanner. However, for many people the ease and speed of using a slide converter is worth losing some image quality. 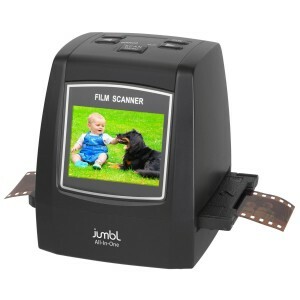 The Jumbl 22MP is currently a bestselling slide to digital converter that can convert various formats of film, slides and negatives to 22 megapixel JPEG images in seconds. Film or slides are hand-loaded into the device and an internal camera captures the image and saves it to a digital format. The resulting JPEGs are saved to the internal memory or to an SD card (purchased separately). Stand alone unit. Saves images to memory. Built-in option to improve scan to 22MP. User-friendly, just push a few buttons. Overall the Jumbl is not that much different than the Wolverine models below as far as formats that can be scanned. It does have the advantage of an increased resolution up to 22MP if the default 14MP isn’t good enough. And when it comes to Jumbl vs Wolverine, the Jumbl is more affordable. The downfalls of this unit are the same when considering all converters vs scanners – image quality and output are limited. For speed and price though, the Jumbl remains a viable option. The Titan 8-in-1 is the current bestselling Wolverine scanner. This model comes at a higher price point than the Jumbl but can convert more film/slide formats. It also has an almost 2x larger screen for viewing digital captures. The unit is compact despite that larger viewing screen and can be used with any computer (Mac or PC). 35mm, 110, 127, 126KPK, APS and Super 8. Saves to internal memory or SD card. Viewing screen for real-time observation. Higher priced than other brands. Final resolution of images is only up to 20 MP. 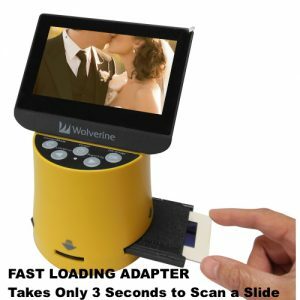 Like the other converters here, the Wolverine Titan is essentially a camera that takes pictures of the film or slides that are loaded into it. This does not always produce the quality that some people desire. 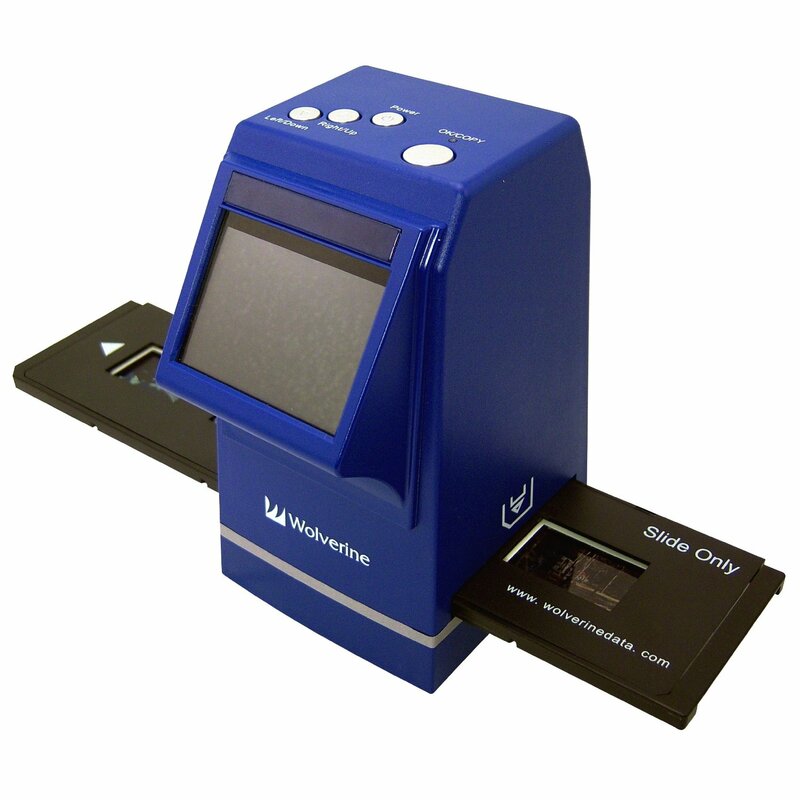 These types of machines are meant for primarily for speed, reduced footprint and cost over a traditional scanner. 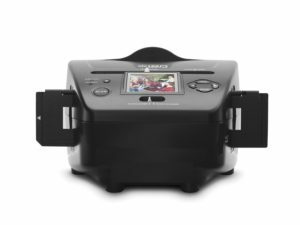 If you are confident that your stockpile of family photos in their negative form is only contained within the 35/135mm format, then the DigitNow film scanner is the one of the more affordable solution on the market. The only concerns when it comes to the conversion process is the quality, convenience, and affordability. DigitNow certainly takes care of the last concern, but how does it fare when it comes to immortalizing your ancient 35mm slides, and its efficiency in doing that? Slide stacker for rapid slide feeding. More affordable than other units. An SD card is not included, but needed for use. The latest operating systems are supported according to the manufacturer: Windows XP, VISTA, 7, 8，10. And you can plug it into your TV for an even greater convenience. All the images will be stored to an SD card, for up to 32GB of capacity. If you are looking for something simple and affordable, the DigitNow is worth evaluating. 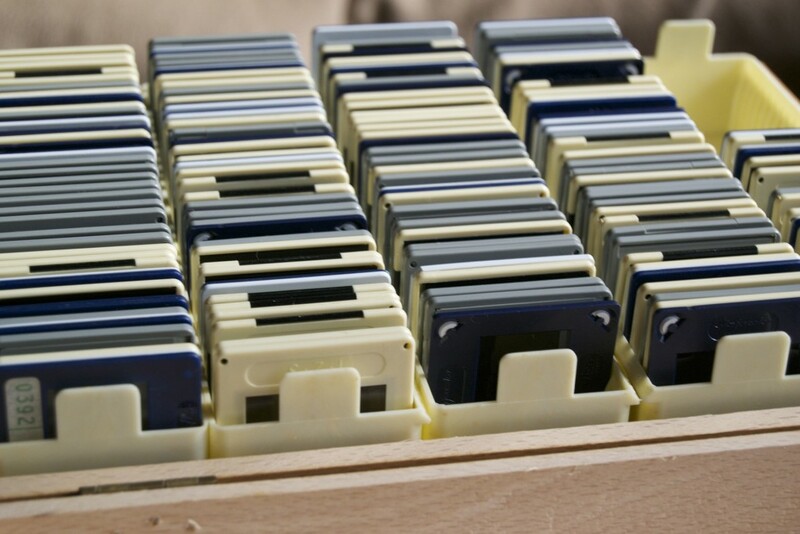 Unlike with scanners and printers, you don’t even need a computer to bring your old photos into the digital era. The Magnasonic Converter has an in-built 2.4 inch LCD screen and enough processing power to perform as a standalone unit. And it even allows you to plug it into every kind of TV thanks to the included Video Out TV cable. Load to save in 5 secs. The same goes for the integrated photo editing software. The Magnasonic Converter has several film profiles which offer enhanced color rendition and restoration. In any case, the results would be better than if you got your films resolved in the now ancient and obsolete dark room chamber. As far as the quality of the scan goes, the Magnasonic Converter is a beast with its 22MP premium scanning resolution. The built-in memory of 128MB is sufficient enough for about 100 photos, and if you need more, the easy-to-use SD card slot expansion will be handy when you are ready to transfer your digitized images into a smartphone, tablet, PC or Mac. 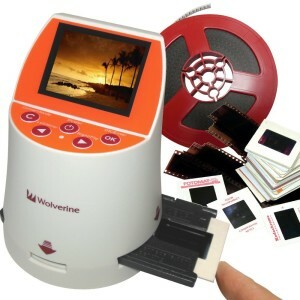 The Wolverine F2D Mighty was along running favorite for digitizing slides. This unit has an internal memory or can be used with an SD card for expanded use. This unit comes with all adapters necessary to convert 35mm, 127, 126 KPK & 110 slides or negatives along with 8 mm and Super 8 film. No software needed. Transfer images directly to your computer. Auto and manual adjustment of brightness. Can be powered by USB or AC outlet. Can’t scan 120 film (medium format). Only accepts a 32GB memory card. Image quality isn’t as good as obtained with a flatbed slide scanner. If you are looking for an affordable and quick method for converting film, slides or negatives to digital images then the F2D Mighty is a great option. You won’t get the quality that you would with a more expensive scanner (like the V600), but the level of quality will suit most people. You can read my full Wolverine F2D Mighty review or see what Amazon reviewers have to say at the link below. 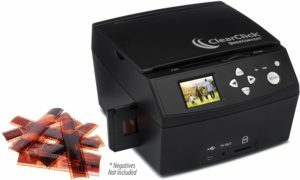 The Clearclick Virtuoso is kind of the new kid in town as far as slide scanners. It looks much the same as it’s competitors but offers some extras with purchase. Like the other scanners, slides and film are loaded into the unit and the resulting image is saved to the machine and later loaded to a computer for archiving. Claims a 22MP interpolated resolution. 8GB SD card included in box. Comes with PhotoPad Professional Edition Software. Compared to the Wolverine Mighty, only 4 formats available. Because the ClearClick is new to the market, there is limited information available in it’s usefulness. It does provide extras that the other converters do not like an SD card and photo-editing software. It also claims to provide a 22MP resolution. Otherwise, the Virtuoso would have many of the same pros and cons of others in it’s class: quick and easy but at the cost of resolution. The Ion Pics2SD is a bit different than the other units described thus far. 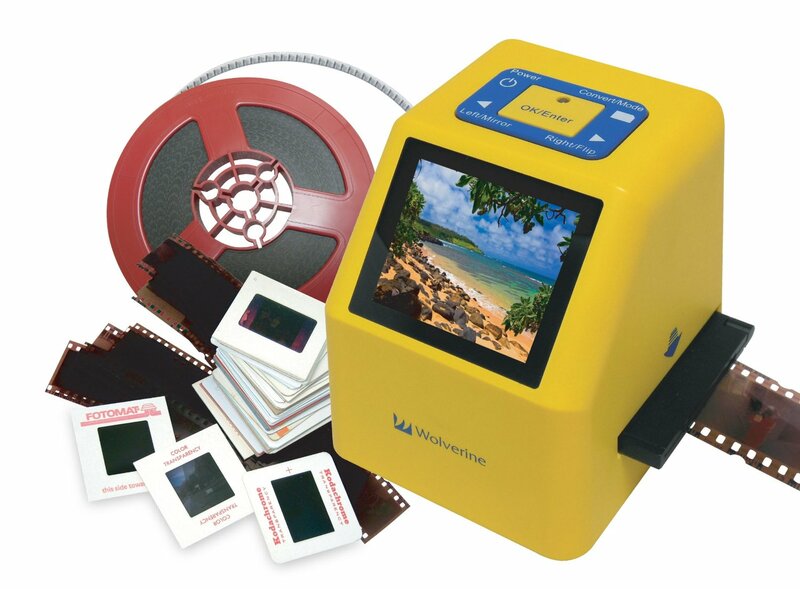 This device can convert 35mm slides and negatives as well as 3×5, 4×6, and 5×7 pictures. If your family keepsakes include old photos and slides, then this unit may be better suited to you. Scans pictures in addition to slides. Larger footprint than other devices. The ability to scan pictures definitely makes this Ion unit unique. But if you are primarily interested in slide scanning, the lower resolution and larger footprint are not ideal. And of course, if you need to also scan film or larger slide formats, this unit will not work for you at all. 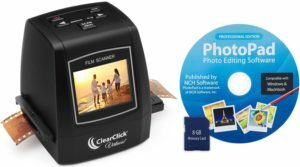 This picture and slide converter from Clearclick is similar to the Ion machine above. 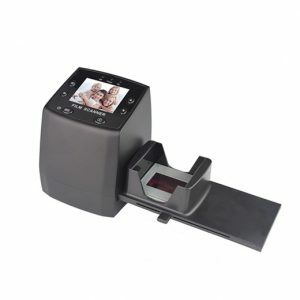 It is a 35mm slide converter that can also scan photo prints to digital images. These devices are usual to those people who find themselves with a stack of pictures and 35mm slides of old family vacations and what not. Since these two scanners are so similar in functionality the additions on the QuickConvert will be listed only. Like the other converter from ClearClick, this is a newer addition to this category. The reviews on this line are quite limited making it difficult to compare to the more “senior” models. Again, before you buy it is important to understand the shortcomings of slide converters vs scanners. Let’s discuss some of the key differences between the two options. Slide and Film converters can generally only handle 35mm slides or negatives so if you happen to have medium format slides (120) you will need to look at a flatbed scanner instead. A scanner may also be better for any slides which may need some restoration or editing. 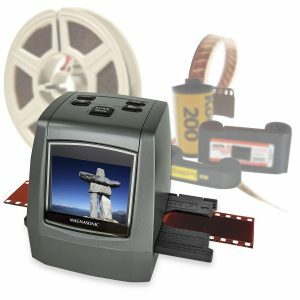 But if you want a simple solution for digitizing all your slides and negatives a converter is a great affordable option. Converting slides to digital images is a smart way to preserve all the important history and events captured on film. But how best to go about the process takes a little forethought. A slide converter and a slide scanner are very different. A slide converter is basically like a small digital camera that takes a picture of your slide and converts that picture into an image file. The output is usually a JPG file between 5 to 9 megapixels. A scanner on the other hand can scan a slide at a very high resolution which results in a better better image in both clarity and color reproduction. 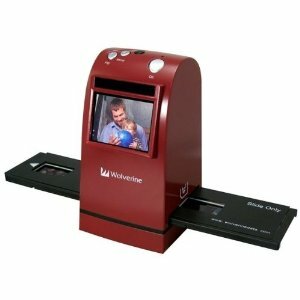 Most slide scanners also have additional features incorporated into their hardware or software which can enhance the final image, things like dust removal or color restoration. Overall, using a scanner to digitize you slides or negatives will result in better images. This can be especially important if you have plans to print enlargements or need to do any digital restoration. Why Buy a Digital Converter? So if a slide scanner gives better results, then why buy a slide converter? The answer is because not everyone needs high-quality nor has the time to invest in such a process. Depending on the number of slides you have, scanning them can be a large time investment because scanning can be slow and more involved. Using a converter is a simple and quick process in comparison. You load your slides into the feeder, hit a button and you are done. Move onto the next slide. A flatbed scanner is a much slower process as the scanning process takes a few seconds, the image conversion takes a few minutes, etc. If you are scanning 35mm slides on a flatbed scanner times one thousand, those extra seconds can add up quickly. Most slide converters are also stand-alone units, meaning you can use them independent of a computer. You can sit on the couch and watch TV while you scan your slides. The digital images are stored on a memory card and can be later transferred at your convenience. Finally, converters are much smaller than a flatbed scanner and generally cheaper. They are a nice option for the person who doesn’t have room for a scanner or doesn’t have the budget to warrant the additional cost. But do be aware that if you buy a slide converter you will be trading ease for quality. There are many mixed reviews online for the slide converters listed here and I think some people may have had unrealistic expectations. Before you buy, make sure you think about whether ease or quality is most important to you. What About Using A Slide Scanning Service? Using a service to scan your slides, like Costco or Walmart, is an option that will save you time. But at what cost. Most people have found scanning services to be very pricey and that is why so many prefer converting slides to digital at home. In addition to the price concerns, there is also a concern for loss. If you drop off your media to a local store or mail it somewhere, you risk your items being lost or damaged. Sure, the risk is probably quite low, but when priceless family memories are involved many don’t want to take that risk. If you still have old family photos in their raw negative form, there is no better time to buy a film-to-digital converter. Like it happened with smartphones, even the baseline models offer features and capabilities that you could only find at professional studios just a couple of years ago. So, you should not link the cost of the unit with its quality and performance. Converting your old photos and negatives has never been easier and cheaper, which is good because unlike digital files, physical film (in reel, slide or negative form) decay over time. With digital images, and the availability of data redundancy with online storage clouds, such concern is completely unwarranted. When you digitize your old 35mm or 135mm slides, they are here to stay for generations to come. That is, if you take care of even the most basic data backup measures, like putting them on your hard drive, Dropbox, OneDrive, or Google Drive.